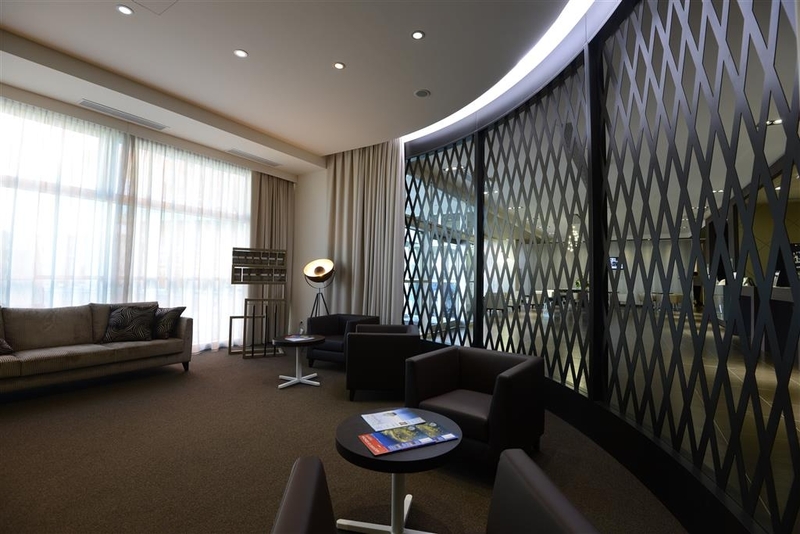 The Best Western Premier CHC Airport is ideally located in the center of Gênes. Come and experience our hotel near the major tourist attractions. Best price guaranteed and exclusive deals. Brand new hotel, built in 2012. 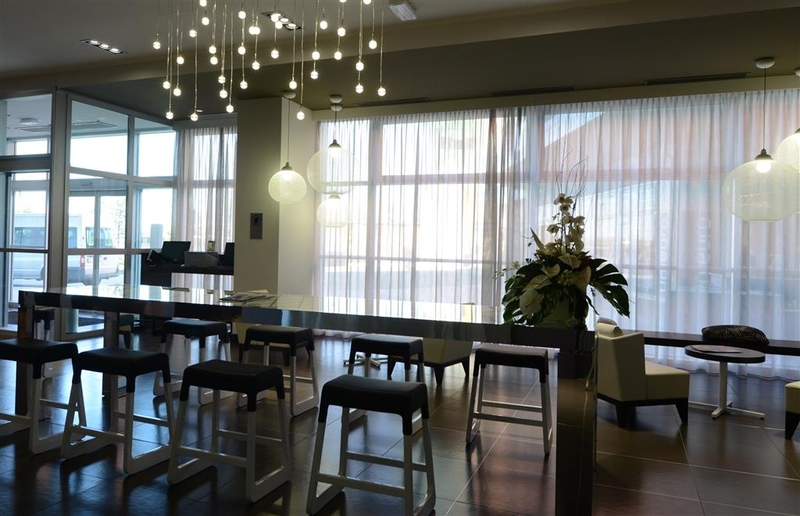 Strategically located in the new business and commercial area of Sestri Ponente, right in front of the Cristoforo Colombo Airport, the Best Western CHC Airport is a modern, contemporary design hotel which offers a high level of standards together with a friendly and guest-oriented service. 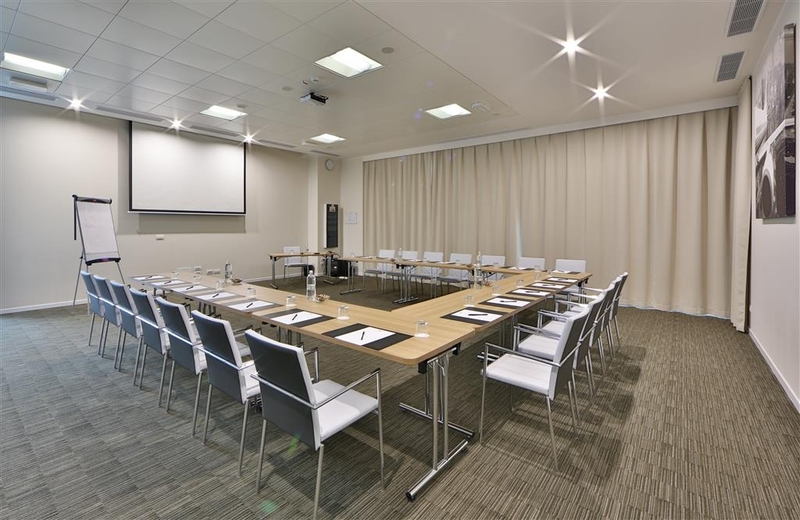 Enjoy our soundproofed rooms after your business day. Prop your laptop on our work desk and keep in touch with your family and friends using our free Wi-Fi connection while you watch your favorite movie on our LCD LED television. 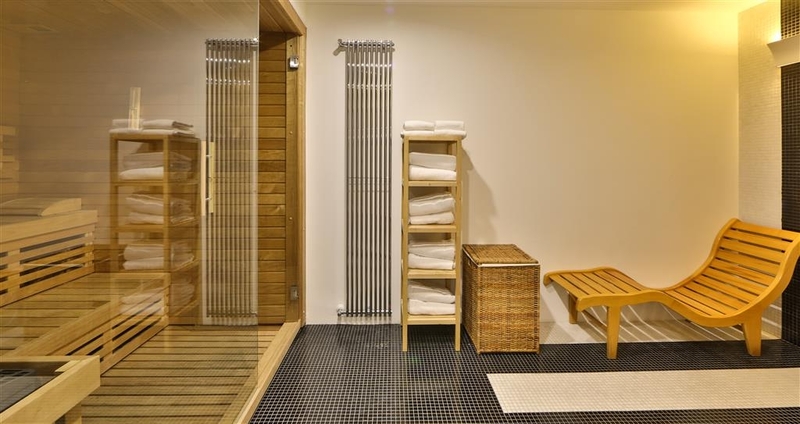 Keep yourself fit in our complimentary mini gym or simply relax in our Turkish bath. 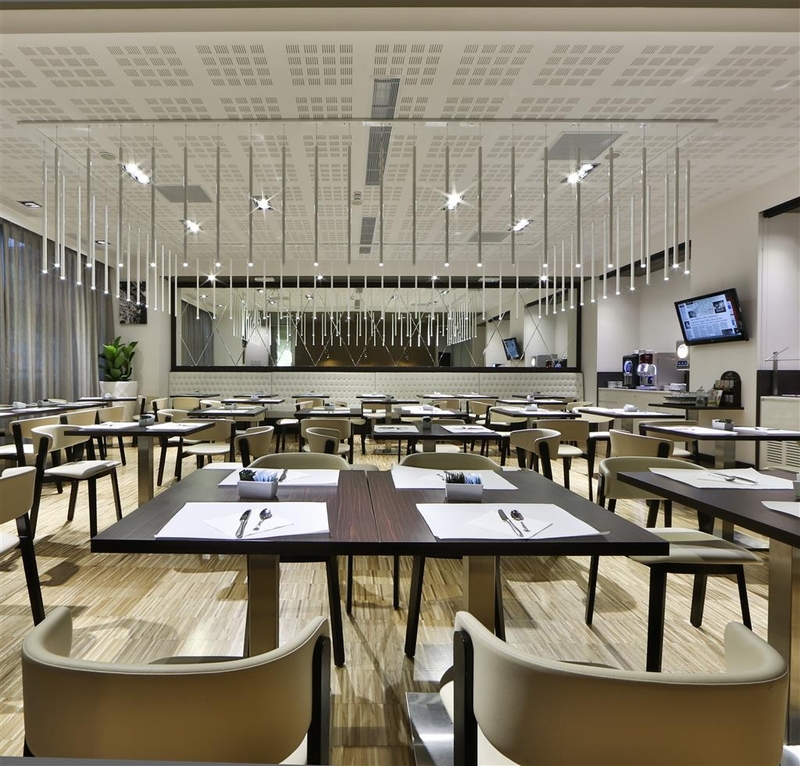 Your stay at the Best Western CHC Airport will not be complete without tasting Genoese and Italian food at our onsite restaurant. 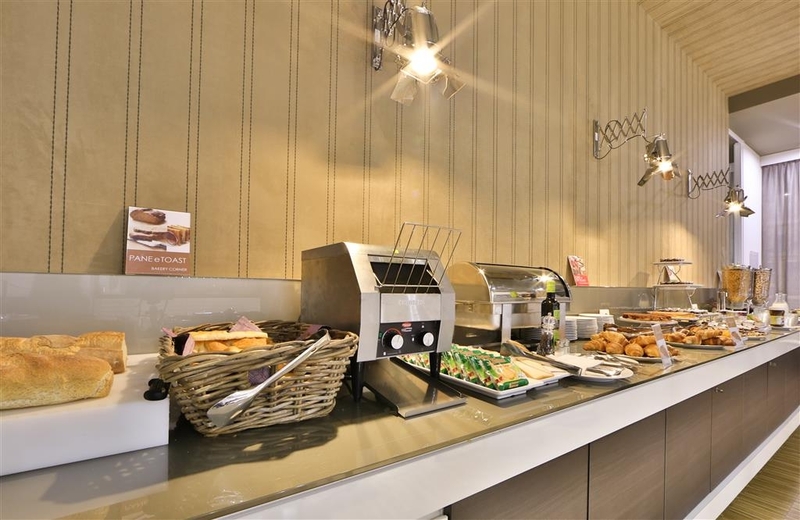 Don't miss our full buffet breakfast before leaving the Best Western CHC Airport and walking down to via Sestri, the most important shopping promenade in town, just few steps far from us. Whether you're traveling on business, for leisure or as a group, there's something near this new hotel. You can easily reach, in just two minutes by car, the new Erzelli International High-Tech Center where important companies like Ericsson and Siemens together with the Engineering Dept. of Genoa University host their headquarters. 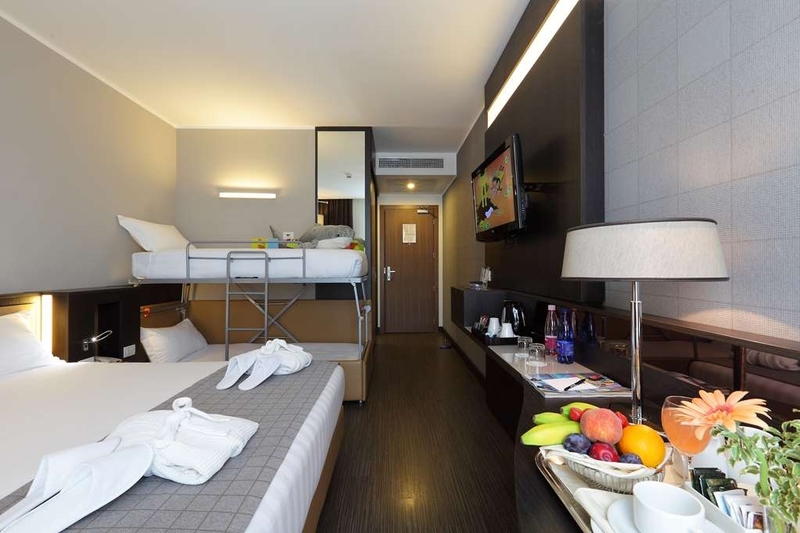 The Best Western CHC Airport is also the ideal place for leisure travelers. The best of Genoa can be reached in few minutes from our convenient location. The largest Aquarium in Europe, the historical center with its museum, art galleries and monuments are only 15 minutes away by car. 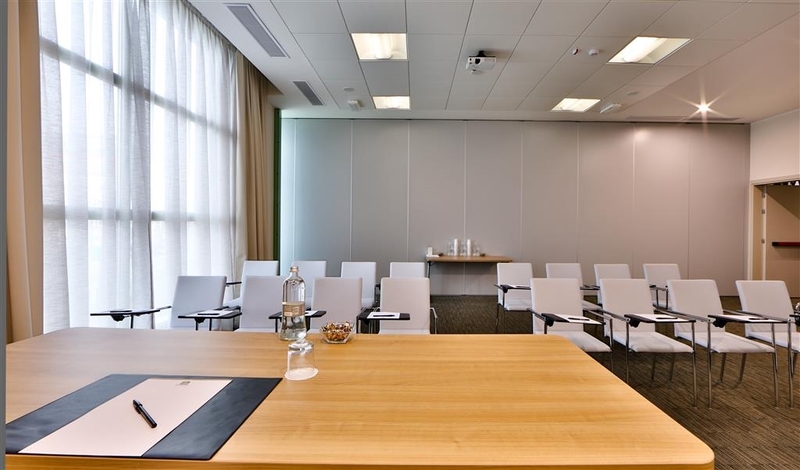 The friendly, helpful staff at the Best Western CHC Airport is ready to ensure a fun-filled memorable stay in Genoa. Make a reservation today and save! It is a shame that I mistakenly chose this hotel. I would never do it again It is smack dab in the middle of nowhere and costs 25 Euros to get to from the central Rail Station downtown. There is a limited hour shuttle to the airport but it to the town that most people desire. I will never stay at there again. The temperature outside was 23"C but there wasn't any Air Conditioning. It had been turned off. The room was too hot and I couldn't sleep. The hotel is right by a rail line and freeway so the noise level was too high to open a window. The engineering is a sham. They can't even remember to turn on their sign on at nite and make it hard for cabs to find the place. The shower floors are so slippery that they are not safe for anyone. I'm sure that lots of people have slipped. The drain covers in the shower are broken. Unacceptable. The breakfast selections are acceptable but are the same daily for the most part. There are no sneeze guards and the hot foods are not hot and the cold foods are not cold. Buckets of ice are unheard of and big glasses are substituted. They must be bought back as there are not enough large glasses to go around. The location of the hotel is industrial and there are not very many restaurants around. The streets are dark at nite and make the area seem unsafe. I like to go out but was unsure of the area. The desk staff are aloof. Do not pick this Best Western. Choose a Best Western in the centre for better security and value. "No airport shuttle - expensive cab ride needed"
This hotel is two minutes from the airport. BUT, it offers no shuttle service from the airport, and a cab ride is a fixed price 20 euros! And its shuttle to the airport is sporadic and does not start until 7 am, so if you have an early flight be prepared for another expensive cab ride (ours was 15 euros). Pretty lousy for a hotel that purports to serve the need of airport travellers. "Just a stopover after Portofino"
After the disaster in Potofino, car stranded, us continuing with our quest to acquire a Siamese cat we decided to stay overnight in Genoa Port area. We had a very pleasant stay in a low cost double room and an excellent Breakfast all inclusive. We dined in the restaurant in the evening and whilst not the most chic the food was very good and the service excellent. This hotel is very convenient for getting to or from the airport in Genoa. The offer a free shuttle service and if all you need is a clean bed this is the place for you. There isn't much around the hotel beyond a toy and electronic store. Meals have limited hours in the restaurant... we arrived around 1430 and hadn't had lunch yet, we had to wait until 1930 for the restaurant to open. The offer a bar service in the lobby but the while the menu offers snacks it's also limited to restaurant hours. We didn't try the room service... ate some nuts and chips to tie us over. The check in process was pleasant and quick. Our room was modern and very clean. We had a good dinner and buffet breakfast in the restaurant. While this is a great pre/post flight hotel, I would likely stay closer to the Centre if you are looking for anything walkable nearby. Coming back from our Cruise we spend the night before going back home, we took a taxi from the cruise port to the hotel and it's not that far. The hotel is very nice and the people are very welcoming, you have access to WIFI. They have a restaurant in the hotel that serves breakfast, lunch and dinner à la carte or buffet. The airport is very close too. We had a very nice time! "Near airport. Not much else." I didn't have a great stay at this hotel. 5 euro per person per day breakfast was fine. Should probably be complimentary, like most other similar hotels. Room was not tiny. But a little run down. We had zero view of anything from our window that didn't open very far. But the main reason for a 3 Star review is the very high prices room service that took 2 hours and 2 calls, for the wrong items (ordered pasta bolognese but got a chicken sandwich). Not close to the train station, nor the fun, historic part of town. And you still need a cab to the airport, which is across a highway. Pleasant service. And great lobby coffee. "Avoid for family trip / A éviter pour un voyage en famille"
Fake triple room (very tiny double with a supposed extra bed (very inconfortable)that they forgot to include in our room). We had to wait 30minutes to get the extra bed.This happened at 10pm and we have a 4year old kid and a baby. Note that some agencies websites say the parking is free there but the hotel fees for the actual garage are 12 euros. "A good hotel in the wrong place"
Although it's a good 4 stars hotel its location near the airport but far from the city center may reduce the target people. It isn't a good option for a tourist because also the public transport communication is not the best and it's also more than what you require for a single night before an early flight. It may deserve a better rating, but it has some minor issues that makes me feel as it should be better than how it really is. Considering the location and cost of the room per night. Pros: - 2 free bottles of water in the room the first day. It cost less than a euro and for sure the guest will appreciate it. What I don't understand is why if the cost of the room is the same every day and the refill the soap, coffee and tea, they don't do the same with the bottles of water. Should I do the check out and check in every day? I'm in a hotel for a limited time, I don't want to look in the street where to buy a bottle of water and the price of the minibar is a joke (as in every minibar of any hotel). If they provide for free the day you do the check in, they should do the same for every day you stay in there. - Good size of the room with modern and functional furniture - Wide bathroom with shower. Enough light, not as in the room, and a movable mirror for shaving. - Free shuttle to the airport, although I didn't use this service but it's always a good service. - Fee, although unguarded, parking - Fast internet and without the need to introduce the password every time you back to the hotel from outside - Shoe cleaning machine in every floor Cons: - The location is not the best unless you're staying here to work in the area. Without a near subway station, and taking the bus in an unknown city without even speaking the same language isn't the best idea. - The light in the room is not enough if you must continue working in it. - The minibar is in the closet, what reduces its available space - The door of the closet cannot be completely closed. I thought it was a problem of my room but it wasn't, it's designed that way for a reason I'm not able to understand, because it happens also in the other rooms - Window from the ceiling to the floor. Maybe it's not the best idea for a hotel room. If you open the curtain to get more natural light, you'll be exposed to everybody from the street - The quality of the tea bags and coffee in the room are awful. You'll probably tried it just the first day. It's something cheap, they should provide something a little better. - Why there aren't green tea. I suppose the one in charge of this don't understand not all the tea are the same no matter the time of the day when you're going to enjoy it. 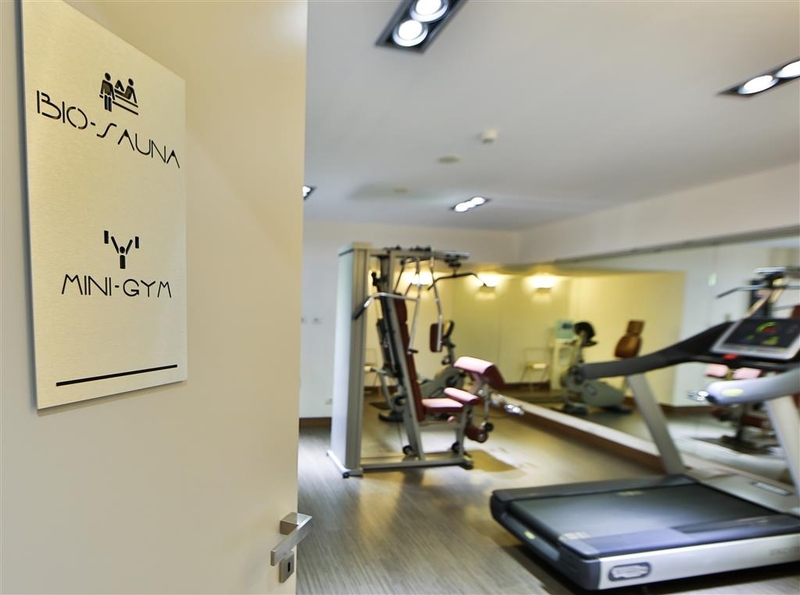 - The hotel is supposed to have a gym. I wasn't expected a complete gym but two old machines in a room are far from my idea of a gym, not even a casual one in a hotel. - The restaurant, gate 15, where to have the breakfast isn't small but the tables are too near, what makes uncomfortable to move between the buffet and your table. - The quality of the coffee from the machine is as bad as the one in the room, you can ask for a good coffee to the waitress but they are usually too busy and I don't like to stop their work. - At least here you can have a good black tea, Twinings, but the selection of tea is very small and there aren't infusions beyond the lemon and ginger one. - Why are the glasses so small? You have two options, take more than one or refill once and again for a standard quantity. - The natural orange juice is a very good idea, but it's a do it yourself and you'll find with the odor of the oranges in your hands and also consider the small size of the glasses. I don't get the average 4.5 stars for this hotel on Tripadvisor. To my husband and me, it is an average hotel. We stayed overnight because we had a 6:30 flight in the morning to Rome. Asked for a shuttle pickup when we arrived in Genoa the day before leaving, around 4pm. The shuttle came very quickly. Found out that the shuttle only runs starting 8am, so it would not be available the next morning. Although the hotel is only 1.3km (according to Google Maps) from the airport, there are no sidewalks. Taxi ride to the airport costs 15-18 Euros (surprising given the proximity - must be some sort of airport tax), so add that to the cost of the room. We had a king bed room. The room itself was fine. Bed was good, although all the pillows were high and hard as bricks. My husband ended up using folded towels as substitute. I got a crick in my neck. Water in the bathroom ran yellow when the tap was turned on. Reception said it was okay, just keep the water running, and, yes, it is potable water. The water did clear eventually, but we were leery of drinking it. Luckily, there were 2 complimentary bottles of water in the room. Water pressure in shower very weak. Shower pan very slippery. Wifi good - able to stream Netflix without problem. Area around hotel somewhat dirty and industrial. There is a pedestrian-only area with small shops and bistros a 15-20-minute walk away - Piazza dei Micone. Nice, new, modern hotel. Rooms are comfortable and staff is very helpful. Access to airport, even though only a mile away, is limited to motor transport. Their shuttle has very limited hours. The lobby bar and restaurant are convenient and good quality. We arrived late in Genoa and needed a known quantity for a place to stay. We had free parking, a big room, and a good breakfast. The staff was nice and helped us get settled in without delay. Thank you for the great but all too short stay. 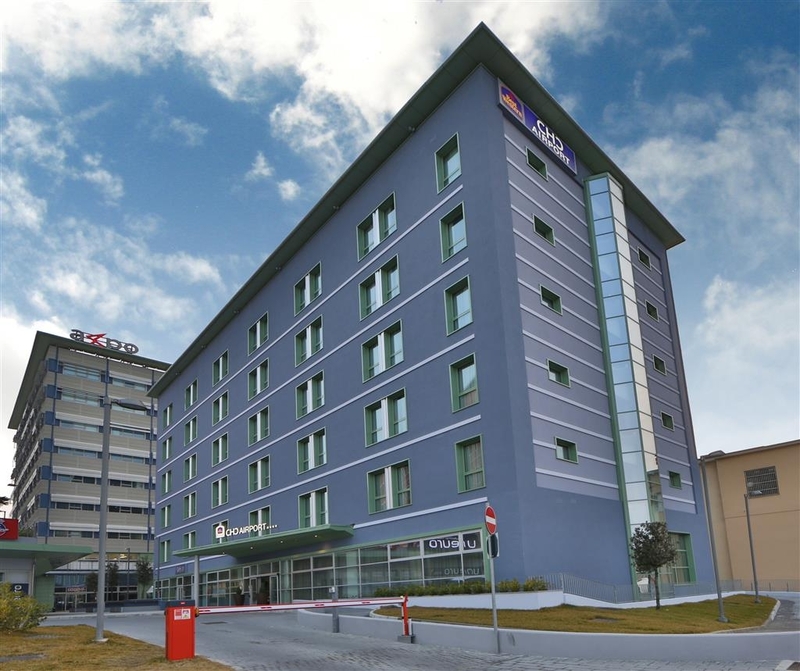 "Awesome, ultra-modern hotel close to airport and train service." Stayed two nights while passing through Italy. 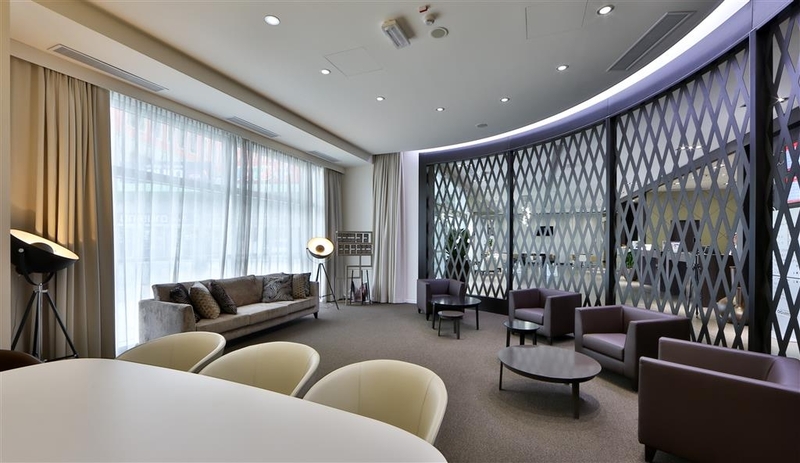 Ultra-modern hotel primarily catering to business crowd. Sufficient ans substantial breakfast options. Awesome room. Great staff. 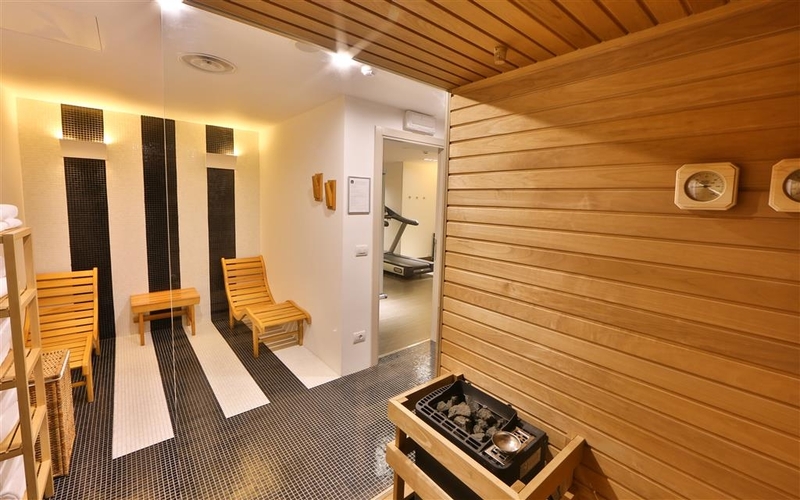 Sauna and small exercise room. Walking distance to trains and local dining and shops. Not an area for family tourists. 5 mins from the airport and nestled between the main roads/railway tracks and the hills the hotel is ideally located for the airport. Although not necessarily the quietist hotel.My room had a view of a lovely pink building. Ok to be serious. The staff were both friendly and efficient. The room was comfortable and clean and the breakfast was tasty. I didn't have enough time to use the gym but although basic it was usable. I wouldn't even try to run from here. "Good size rooms with nice beds"
I enjoyed our stay at this hotel. The beds were soft, room clean, with modern bathrooms. This was very similar to a US hotel standard. The shuttle does not start until 8:00 am, which is a waste. Taxi will cost you 20 euros to go a half a mile. I thought this location was more fun with shopping and restaurants in the area open late. Shopping open until 7:30 pm and fine dinning started at 7:00 pm. Everything was in walking distance two blocks away. The rooms are clean, the breakfast is excellent and the staff are welcoming! The hotel is close to the airport and the hotel offers a shuttle bus. Walking to sentrum takes a while, but it is not a problem as it is easy to get a taxi. "Not for culture but perfect for function"
OK, this hotel is in what amounts to a commercial/industrial zone in Sestri. The Sat nav in my BMW cannot find it under Genoa. It is brilliantly convenient for the airport. There is the main railway station of Sestri P within walking distance. So, locational charm 0/10. If you book it thinking that you will have a nice view of quaint little streets as against a main road, railway line and shopping centre then forget it. On the other hand, if you want an efficient, spotlessly clean hotel with a good room complete with all amenities (save for milk to go with the tea/coffee) at a reasonable price then go for it. The staff are extremely helpful. Directed us to Il Vicolo which was a typical good value Italian restaurant not that far away. The breakfast is superb. 10/10 for the fresh orange juice. Everything works. To be recommended for what it is. Very convenient, close to the airport, with a shuttle to / from it. Walking distance from a pedestrian area with restaurants. It's perfect for short trips to Genoa visiting customers up the hill. If you intend to visit the city center, there might be better options there though. This hotel met all of our needs. We were only here for one night after our cruise. We wanted something within walking distance of the center which is exactly where this hotel was located. We were able to walk to the Cathedral, to the Port etc. The staff at the hotel was more than accommodating to our group of 9 with 3 children under 4. They were very friendly and never seemed annoyed at the noise our kids were making. Great breakfast the following morning. Would definitely stay here again when in Genova. "Hotel is ok but Taxi to the airport is a rip off"
Hotel is new and clean according to its 3 stars. However, we chose the hotel for one reason to have an easy ride to Genova airport in the morning. Our flight was at 7am however the shuttle does not begin operating till 7am so we had to take a taxi. A TAXI that the hotel will call you is a complete rip off - they charge you 20 EUROS for 2 MINS ride which completely defeats the purpose of staying next to the airport, because a ride to Genova city center is 25 euros with many more hotel and dining options. The hotel has a good location. The rooms are comfortable, large and clean hotel. Auto parking is with extra charge but it is cheap. Breakfast is expensive but there is a nice cafe just close to the hotel. "GREAT.......suitable location for joining a cruise." This is a GREAT hotel for many reasons. Arriving at the airport just telephone the hotel and suddenly there you have a shuttle bus to take you directly to your hotel. A friendly and helpful welcome awaits you. Check in was pleasant and swift. The foyer under sells the rest of the hotel. My room was perfect, spotless and very, very comfortable as was the bathroom. I have no reservations about recommending this hotel. As I had an early morning flight, I booked a room at Best Western as it is conveniently located 5 mins away from the airport. As others have noted here, although the exterior of the hotel is nothing to write home about, inside is a whole different matter. The room was spacious, nice and clean. Moreover, despite the airport being a stone's throw away and my room being next to the lift, it was really quiet. The reception staff is courteous and polite. Did not try the breakfast as left early, Wi-fi connection is relatively fast but the connection method is a bit awkward. All in all, a solid choice for those arriving late or leaving early. "Horrible hotel DO NOT STAY"
"Comfortable hotel with good location "
Stayed here for a week and had a comfortable time. 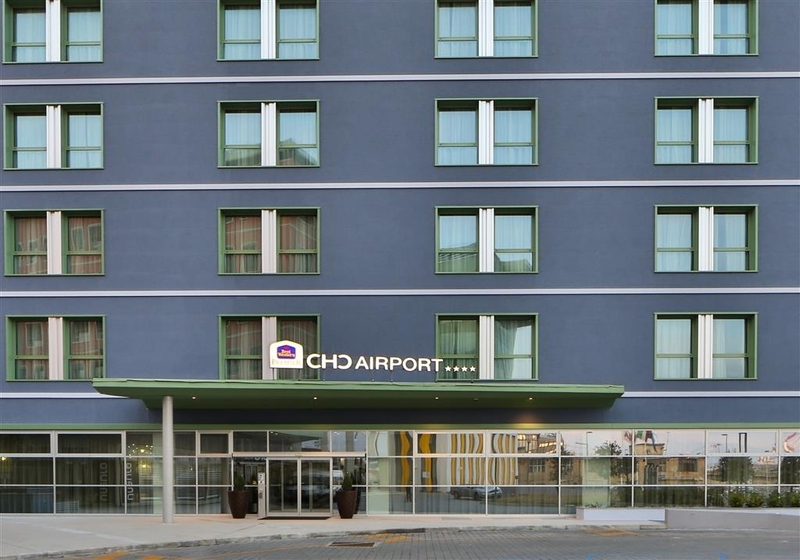 Best part of this hotel is very near to the Genoa airport and it also at the walking distance from the railway station. Hotel also have free airport pickup and drop. 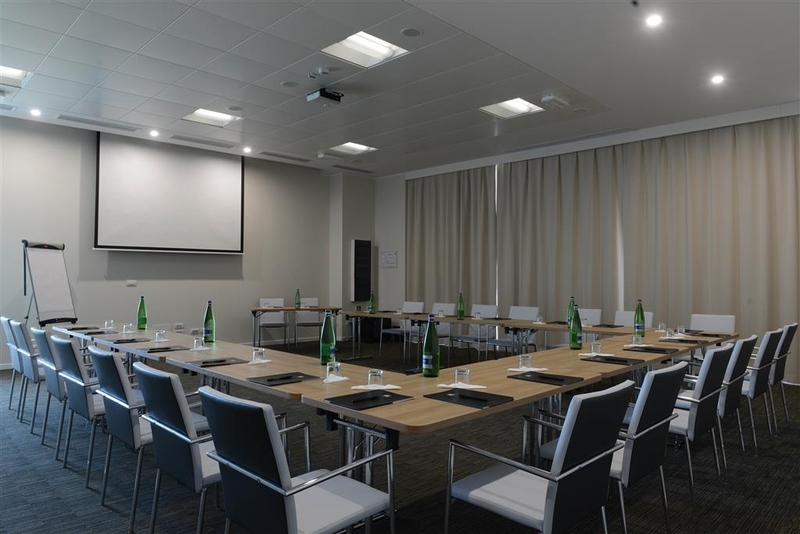 All these facilities make this hotel extremely helpful for bussiness travellers. Hotel also have a restaurant and serves nice Italian food. 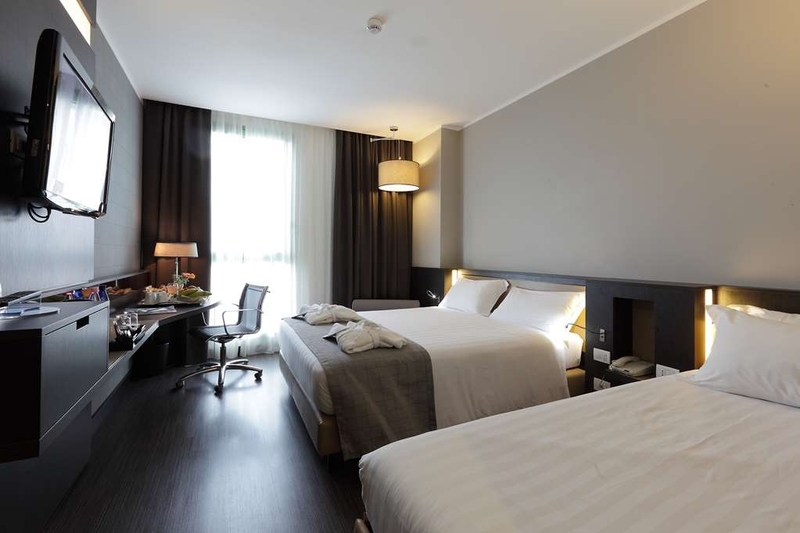 Hotel is also near to the shopping street and close to good restaurant in case you do not want to eat the hotel. Rooms are specious and maintained well. Over all a good choice to stay in Genoa. "Practical location for early and late flights"
We spent one night in this hotel after a late landing at Genoa's airport before driving to Tuscany the next day. The hotel is less than 5 minutes by car from the airport; we had our own car, so I do not know if there is a free shuttle service from and to the airport. 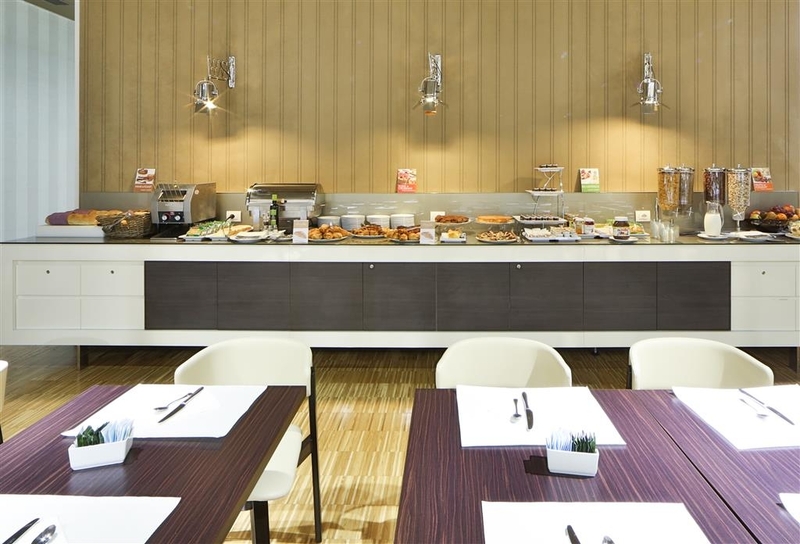 The room was clean and big, the staff friendly and the breakfast buffet was rich and good. The location is perfect for business travelers visiting companies in the Sestri Ponente area, the city center and the attractions are around 8 km to the east and can be reached by train or by bus (Sestri Ponente Railway station is around 600m from the hotel). This accommodation suited our needs very well. I choose this hotel because it is near to the location I had to visit. The room are big and the bathroom has a good size also for two people. As I was alone, plenty of space! Breakfast was good, enough selection and the price is very good. I will stay there the next time again. From the outside the hotel doesn't look like much, but inside it is really nice with modern decor. The room is nice and the bed is very, very comfortable. Shower is great. Wi-Fi connection in the room is very good. Breakfast buffet (€5 p/person)is quite nice and coffee is good too. "Good hotel and nice staff"
For nearly 6 months I was a host in this hotel for business purposes. I liked the high standard of the hotel and appreciated the smartness of its personnel. Even the personnel at restaurant was very smart. "Very good because of receptionsts"
Went to Genoa for a business trip and spent three nights in this hotel. Hotel is good but I had to mark as very good because people at reception were lovely, so professional and helpful. Room size was ok, shower needs to be fixed, my bathroom was flooded every single time, something is not right with how the whole shower is set up. My colleague had same experience in her room so it looks like something needs to be fixed. Breakfast was ok and I was delighted to be able to make fresh orange juice but very disappointed to see rotten oranges between the good ones so again ,something to be checked. Very convenient hotel location if business is close to that side of the town. By bus, you need around 25min to Genoa city center. Lovely restaurants walking distance from hotel. Would like to go to this hotel again. 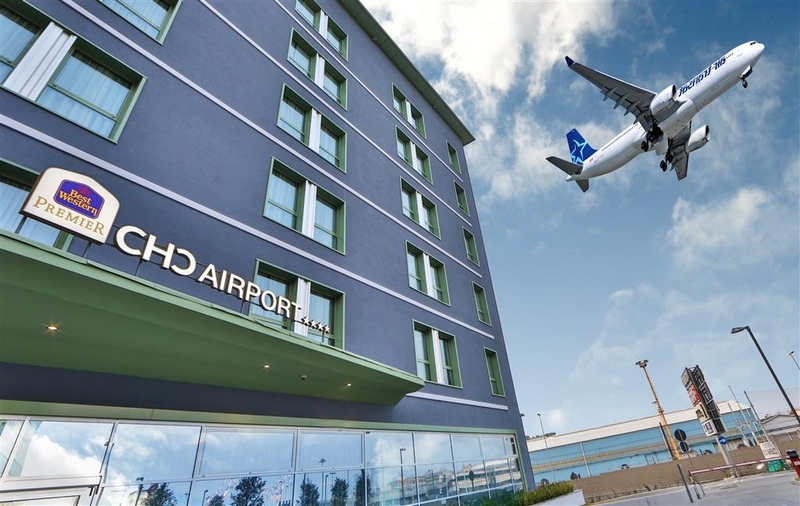 "Conveniently located to airport, typical business hotel"
This is your typical Monday to Friday business customers oriented hotel close to the airport. Wouldn't necessarily recommend it for a romantic weekend getaway. 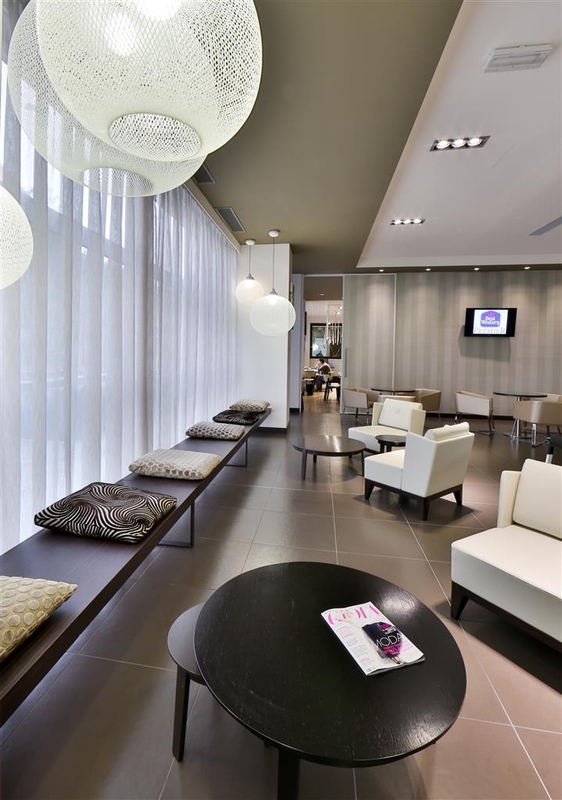 But if you are in Genoa for business around the airport or the port, this hotel is a good choice. Offers on site parking, breakfast, full bar in the evening and clean rooms. Pricing is not cheap but adequate. Matresses and Pillows are a little on the hard side. Comfortable and well equipped hotel. 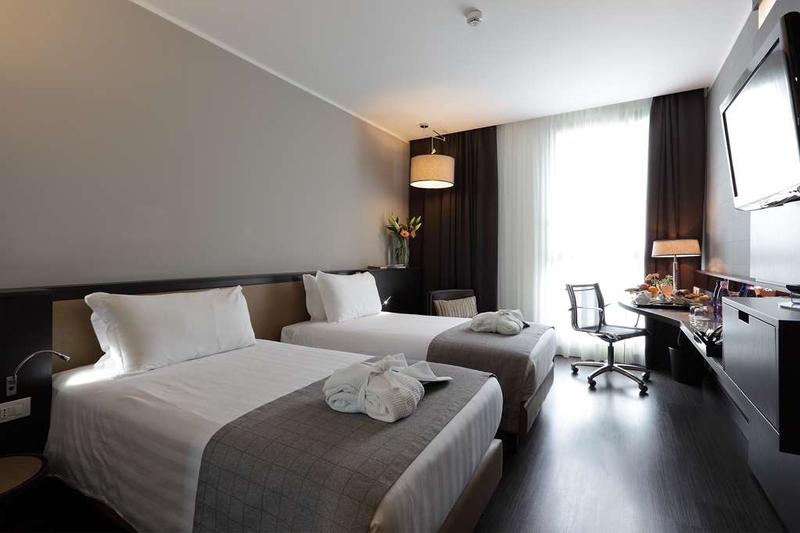 Location is not that great if you want to visit the city but the hotel has quiet rooms, good aircon, beds and showers. It's also easy to reach from the motorway. Would book again when staying in this region. Be sure to check on exact location and turn off dual carriageway before travelling; it is in part of a mini commercial area, and if you miss the turn off you have a real turnaround problem! Park in the general car park, do not unload baggage; check in, then move car to under hotel garage - off load there with direct access to hotel lift(s). Hotel reception staff very good, rooms excellent, ultra modern, aimed squarely at business use with fixtures and fittings. Minimal English language TV. Restaurant ultra modern, BUT also ultra ultra bright, and musak running at about 95dB - difficult to hear partner's conversation, let alone anyone else! Atmosphere rating close to zero - but there is no alternative available within walking distance, and the "old" town is a 15 minute taxi ride. Service reasonable, but subject to excessive delays if a party of 8 arrives - all existing customers forgotten. Food quality reasonable, but not outstanding. A big let down for the hotel. Breakfast reasonable with quite good buffet available. Strangely many more people than at dinner - did they all eat out the previous evening? Overall a reasonable overnight stop, but the restaurant ambience, lighting, (staff) and musak would benefit from some revision! "nice room, breakfast could have been better"
I stayed for 3 nights in the best western and I had a good stay. Great hospitality, very clean room with nice interior design. Breakfast was okay, just average, could have been better for the price you pay. Very convenient location with the airport and Sestri Ponente train station reachable by 10 minutes walk. Clean and quite rooms + very good restaurant with some typical Ligurian meals. Helpfull staff at the reception. Large, clean and comfortable room. Easy to find. Welcoming receptionists. Wonderful breakfast included (pancakes!). Perfect for an overnight stay prior to a flight. Parking 12€ overnight but we managed to get one of the few spaces outside the building next door for free. "New, modern, clean and friendly business hotel "
Stayed one night to catch a flight next day. We were lucky to park in front of ABB office, practically at hotel entrance. Check in/out efficient and friendly. Rooms modern and equipped with everything a business traveller requires: fridge, fast wifi, International power sockets. 5' from Airports. Dinner we had in town. 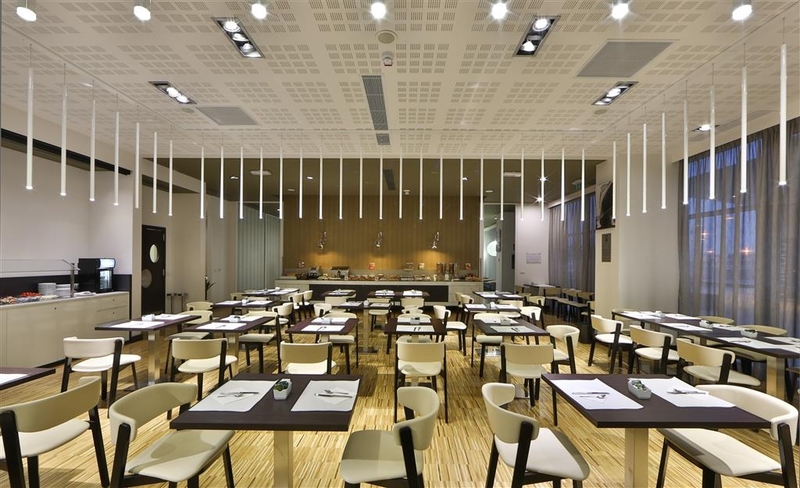 Clean, modern hotel with lobby restaurant. This hotel is a typical business type hotel. The rooms are average size, but rather dark. Convenient amenities and a helpful staff. 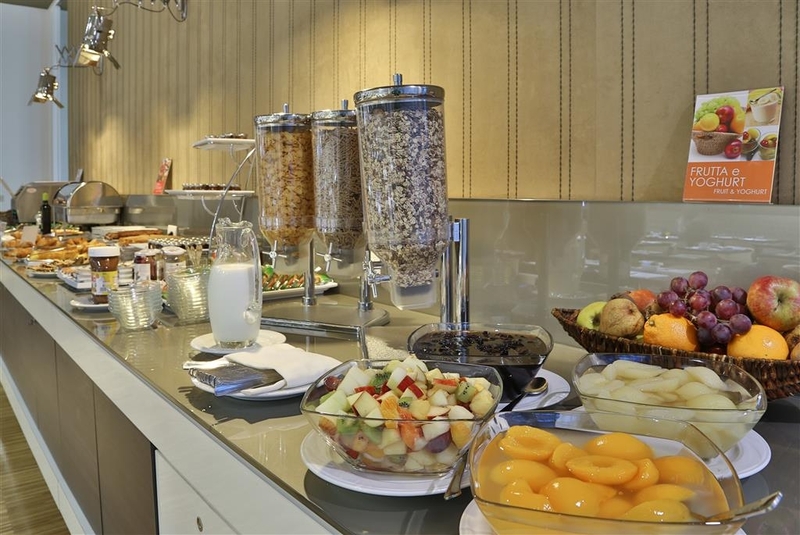 The restaurant offers a wide variety on the breakfast buffet, a pleasant lunch menu and standard dinner offerings. Plentiful parking, but difficult to get in and out of parking lot due to divided road in front of hotel. A short walk to area with shoppes and restaurants. There is a small gym located in the basement next to the elevators. 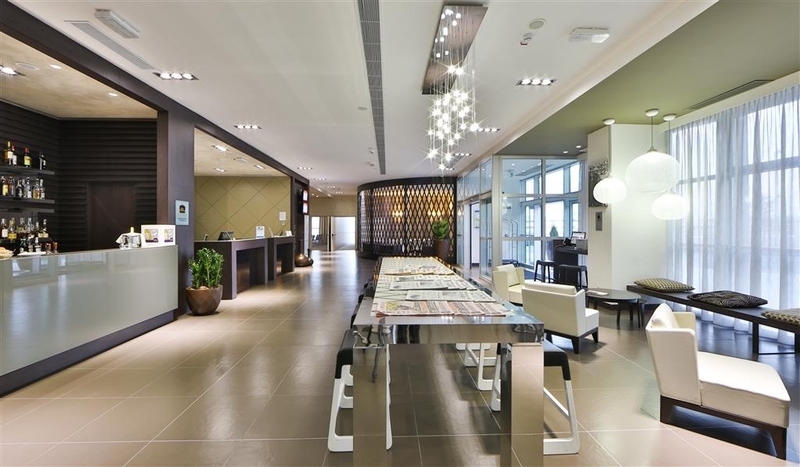 This hotel is very nice -- lobby, restaurant, and the rooms are modern and attractive, BUT management needs to do a lot more about helping their visitors get to the airport without being ripped off. After days of traveling, we chose this hotel for the last night of our trip because we had a very early flight out of Genoa the next morning and being near the airport was important. The hotel is only a couple minutes away from the airport so we figured it would only be a few euros for the ride -- we were amazed and angry after our three minute ride, when the cabbie charged us 20 euros! He insisted this was the standard fare but it seemed ridiculous because we hadn't paid much more than this the evening before for a cab ride from the train station in Genoa all the way out to the hotel. When we checked in the the hotel, we asked about getting a taxi in the morning and they could have told us at that time about this absurd pricing but they didn't. A day later, after calling to complain, we were told that they are aware of the varying prices the cabs charge (usually 15 euros so we were gouged even MORE!) but the hotel staff didn't warn us. We were also told that the hotel does have a shuttle bus but it doesn't start service until 7 a.m. so anyone leaving earlier is at the mercy of this cab company that we were told is the ONLY one in the city. Suggestion: the Best Western needs to be more forthcoming to visitors who must take a taxi when heading to the airport. Even better suggestion: the hotel should make their shuttle service available for people who are on the early flights in the morning; that should be a basic service for any airport hotel. We stayed for the night to catch an early flight and we were very happy with the Best Western. The room was clean and the staff was friendly. Because we arrived late., we decided to eat on site and the restaurant and really enjoyed the food. I would stay here again for work or fun! "Modern hotel close to airport"
This hotel was very modern and comfortable with nice rooms, nice bathrooms and excellent air conditioning. We chose it because it was close to the airport and we had an early morning flight out. We took a cab to the center of town and back to explore more. The room service meal was not very good, but room service often is not good. 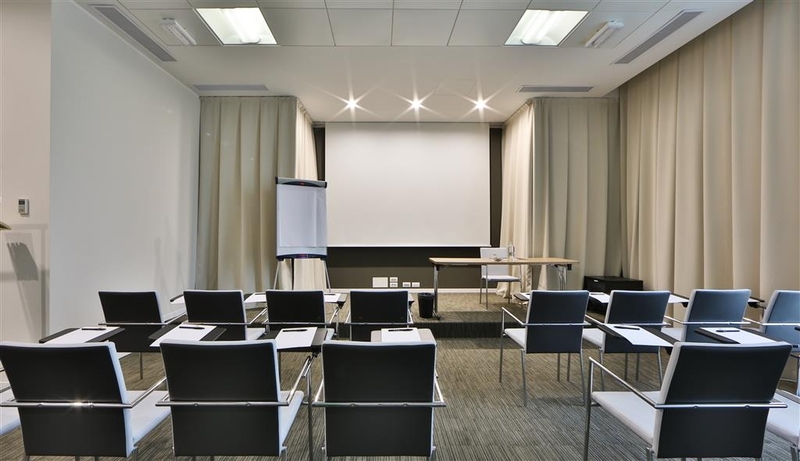 Overall, the room was very comfortable and quiet and service was helpful and attentive. "Decent and value for money"
Stayed here for 3 nights in April 2016 for business meeting. Complete value for money, newly renovated rooms Pro: decent size , good quality bed and bathroom . Breakfast was good, near airport Con: location , no restaurant around had to walk 2km to find one. I have no problem staying here again for business. "Good mid-range hotel, a little off from the center"
Stayed for a couple of days to explore Genoa and it's surroundings. It's a good hotel, modern and clean with friendly and helpful staff. If you don't have a car or dont want to get a taxi, then you will have to jump on the bus which is approx. 30 to 40min to the city centre. There are some very nice local restaurants in the area, just ask at reception. It it's probably your hotel of choice for business and/or when arriving by plane. "A place not to stay"
Room is ok, cleanliness is lacking, nothing to see that is close by the hotel. What disturbed me most is the way I was treated after I discovered that they charged my hotel room twice. I made one online reservation and for whatever reason I received two confirmation emails. It seems they send the confirmation email twice. Anyhow when i arrived at the hotel nobody mentioned that i had two reservations. I stayed there for one night and a couple days later I realized that i was charged twice for my hotel room. So I asked for a refund, however they said i made two reservations and their policy is no refund. It is very annoying dealing with this hotel and therfore I do not recommend anyone to stay in this hotel because they are not interested in the customers. 5 minutes from the airport with a shuttle bus available. Very modern and comfortable rooms. Good buffet for breakfast. Real business hotel in not a particularly nice environment. Was very busy at checkout on a Friday but friendly staff. Not a holiday resort. The hotel does not look much from the roadside, but inside is a lot better. I had heard the staff could be a little funny, but had no trouble myself. The rooms we very clean and perfect for my needs whilst on business. Breakfast was excellent, with a good typical European cuisine, breads, cheeses, yogurts, fruits etc. All was fresh and very good. They have a restaurant in the holiday in which I ate on my last night. The food was again to a very good standard. Whilst the hotel restaurant was good I would suggest some of the local restaurants first as there is so much excellent choice in the local area. There is some road noise, so remember ear plugs for a totally restful nights sleep. I would visit this hotel again. For a budget airport hotel this was quite acceptable. The rooms were an alright size and had the basic amenities although you would expect complimentary water and coffee if the kettle is available. Either they forgot or they don't provide it i'm not sure but it was quite late when we checked in so we couldnt be bothered to ask. The wifi failed to connect as well. The bathroom was clean and had the necessary amenities. I would like to mention how excellent breakfast spread was especially the bakery area. All in all a good stay for one night. "Ugly location, Rude, Stressed Staff but Surprisingly Good Food"
We were forced to take this place, due to our regular Genoa hotel being full -- and when we arrived we realised that its only advantage was for catching early morning flights from the nearby airport... but we were driving. It is a new structure effectively located on an industrial estate north of the airport and opposite the railway goods yard... with grey scenic views to match. Not a great introduction to the 'Italian Riviera'. The reception staff were clearly inexperienced, harassed and almost rude -- not the kind of welcome that makes you feel at home. 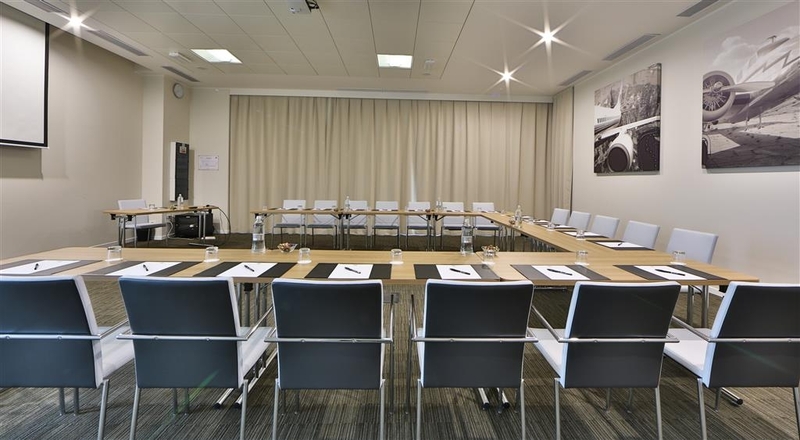 The rooms, however, are modern, clean and well-appointed. Due to the location, you are almost compelled to take dinner there, but the food in the poorly lit restaurant was surprisingly good (great steak), with friendly service from the overwhelmingly South American staff. Breakfast too was plentiful and fairly good value. Not the kind of place one would choose to stay -- a distress purchase only. I recently stayed at the Best Western from 18/10 to 23/10. Check in was QUICK, FAST and EFFICIENT upon which I was greeted by two very friendly hosts, Denise and Giovanni. The room was very spacious and clean. The location for me was perfect as it was just around the corner from the office. The hotel itself is located in a short 10 minutes taxi ride from the airport (approx. 15 euros); 10 minutes taxi ride from the marina where one has plenty of restaurants, bars, cafes to choose from and approximately 20 minutes taxi ride to the centre (approx. 25 - 30 euros). Alternatively there is a bus stop 2 minutes walking distance away which takes you directly to the centre (single ticket 1.60 euros). Breakfast was included in my booking and the options were PLENTY and the waiting staff were very attentive to serving guests. I WILL definitely return to this hotel! Grazie mille! 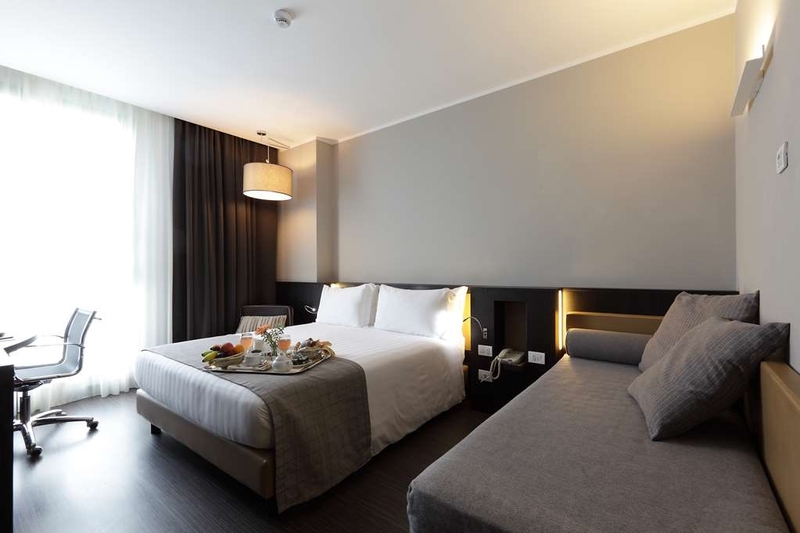 "Excellent hotel for resting during a trip"
Near the highway, with spacious rooms, a really comfortable and modern hotel, to rest before continuing the trip. It is a good choice if you want to travel around Italy. The offer for the breakfast is complete. 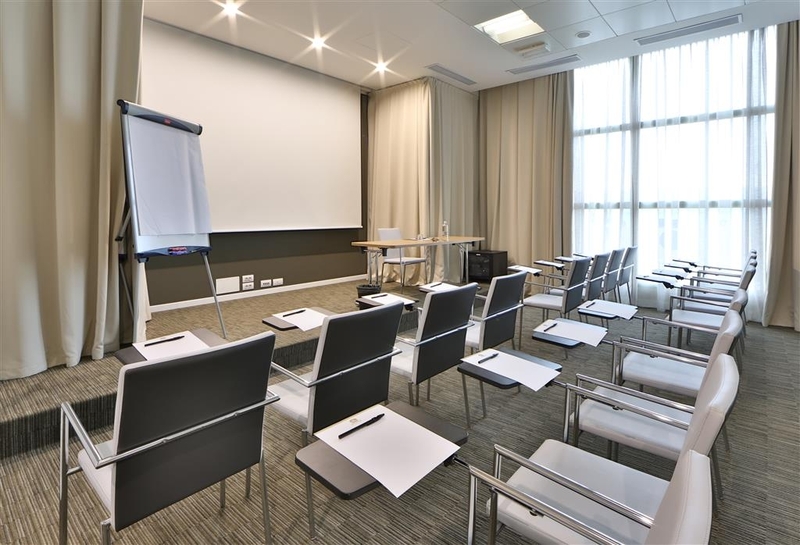 The hotel is very close to the airport (10 minutes taxi ride) and set in an industrial area of Sestri Ponente and has only recently become part of Genoa. The hotel is very new and has onsite restaurant with very helpful and friendly staff. The marina (and airport) can be reached foot in about 20 minutes. The marina is very nice place to walk and enjoy food. Sestri has many wonderful traditional eating places and bakeries making fantastic cakes and biscuits which are hard to resist. Genoa downtown Is easy to reach by bus (Euro 6) or by taxi in 20 minutes. "Great location and service for access to Genoa Airport"
We only stayed here one night for convenience of access to flight the next day and were very pleased. Staff was great, very attentive. Included breakfast was top quality and varied. Easy walk to shopping and historical area of this section of Genoa. The hotel is just ok but in the middle of no where unless you just want to walk around the hotel premises. The management is an example of why all goes wrong in Italy. Total chaos!. Hypersensitive staff unable to handle the problems when something goes wrong and they get upset towards any negative feedback. I am staying at the moment and I am fed up of the hotel only 2 hours after arriving. I do not move to another hotel because it is already paid but PLEASE AVOID AT ALL COST. "My number 1 in Europe so far!" 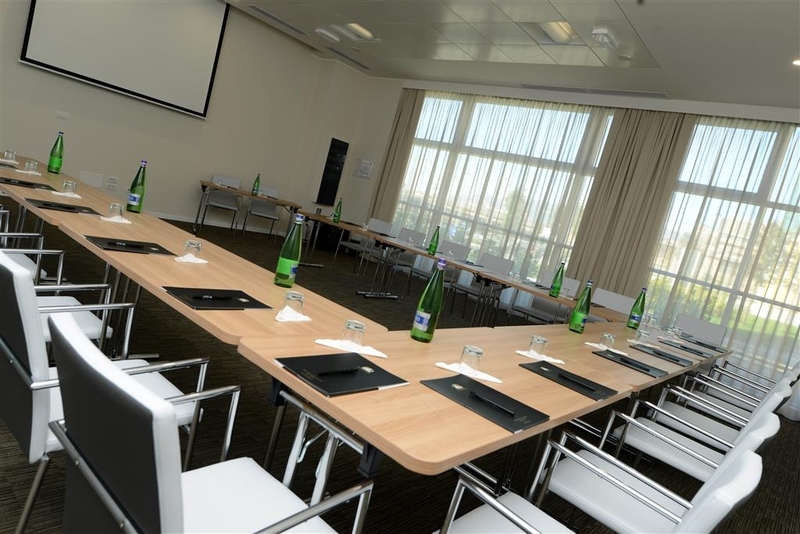 Lovely location, large rooms, super fast internet, classic room setting and facilities and good value for money! I have always love hotels that have utensils for preparing tea or coffee! Best Western Premier, you are my best in Europe so far!